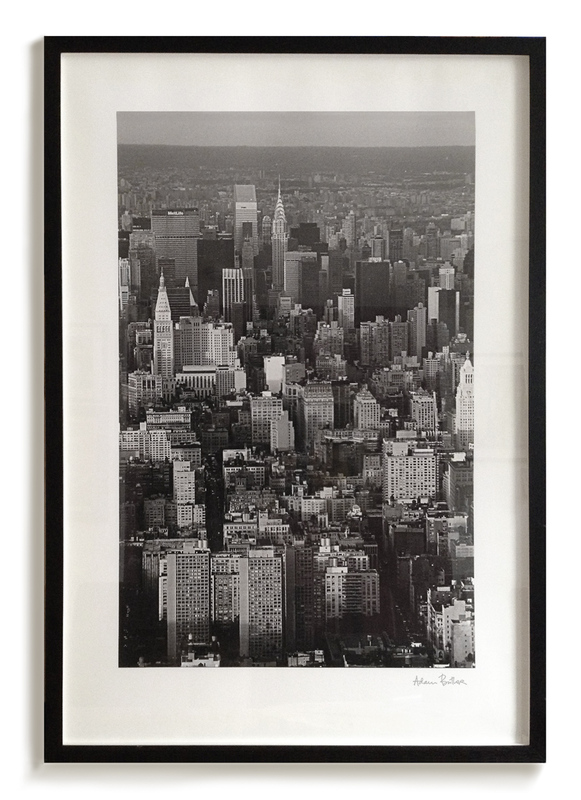 There are a variety of different options when ordering a framed print by Adam Butler, in order to display them nicely and to protect them from the environment. These are the standard methods or options, but of course you can have your print made in any format or media and framed in any way. Images can be printed up to a dimension of 3m x 2m; anything bigger would need to be printed on separate panels and then placed or hung adjacent to each other (which can also look very nice). For archival permanence, Adam recommends giclée prints made on the conservation-grade Hahnemülhe paper and framed in either a box frame or with a mount. These come with a lifetime guarantee; the frames and mounting is done to museum, conservation standards with no glues or adhesive tapes used anywhere in the process. However, I am enjoying increasingly prints made as face mounted acrylic glass on aluminium; these are sleek, luminous and contemporary, and can be printed in large sizes. A frame with mount board with a bevelled edge is the classic and traditional method of framing prints, yet looks great on contemporary images and also in contemporary interiors. The mount boards and everything else is made of museum grade, acid free materials, in ivory or cream tones. The frames are solid wood, c. 20mm wide at the front and 35mm deep, and can be ordered in any colour. Frames are also fitted with a sub-frame at the back to give extra strength. The glass is UV resistant for archival permanence, and can also be ordered as reflection-free glass. 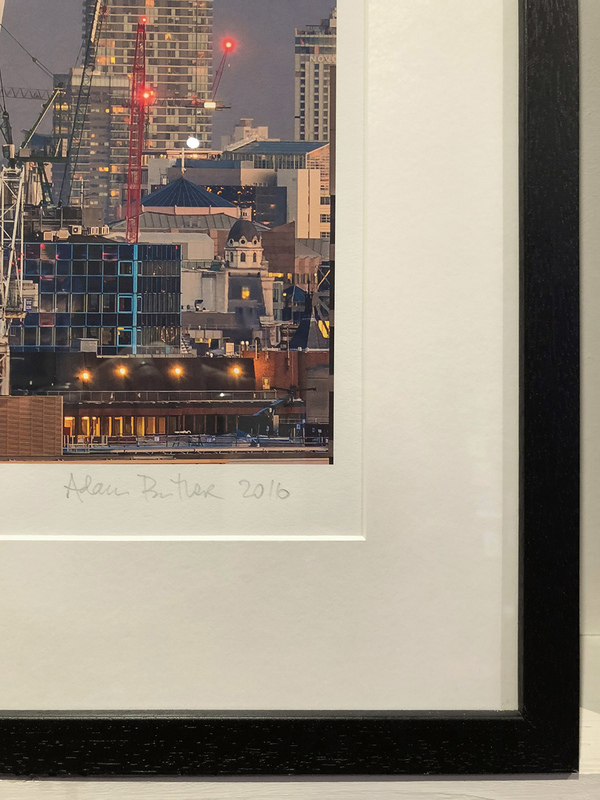 I like to sign, date and write the edition number on each print, and leave this visible by having the mount board cut allowing a space of c. 1cm top and sides and c. 2cm on the bottom all around the printed image. If the print is later reframed, the signature remains. 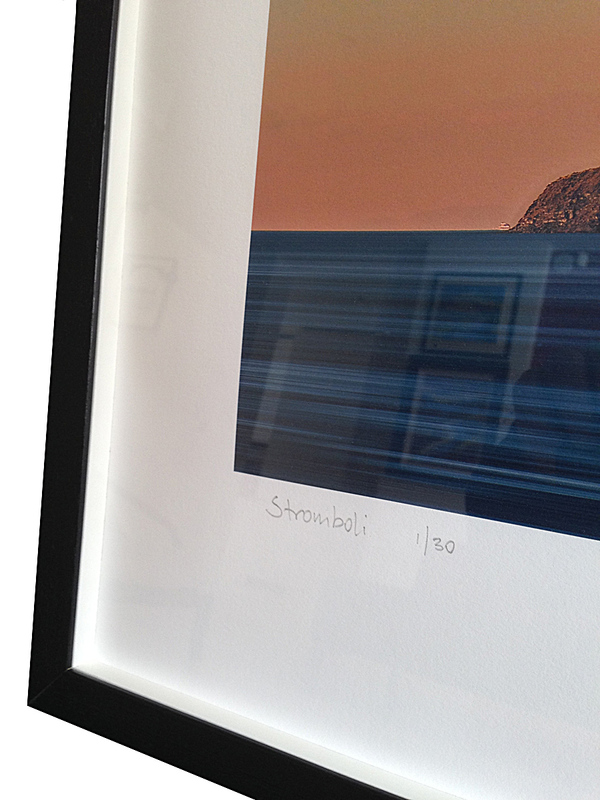 Frames for larger format prints (above 50cm x 150cm) may need a stronger frame with a wider/deeper profile. Metal frames are also available, please enquire. The print is fitted directly into the frame, kept in place with a white (or even black) spacer of approx 10mm depth which sits inside the frame between the glass and the print. This is a more modern look; giving depth to the frame. The prints can have a margin of 5-10cm all around the image, or can be even done with no margin at all. Depending on the size of the print, the frames are solid wood, 20-25mm wide and 35-40mm deep, and can be ordered in any colour. They are also fitted with a sub-frame at the back to give extra strength. Box frames work best with standard sized and format images, with paper size (ie. image and margin) up to about 70-80cm size. Larger or panoramic format prints wider than about 100cm will inevitably have some curling of the paper evident. The way to avoid this is to dry mount the image, gluing them onto a board, but I never do this as it totally compromises the archival quality of the image and is very unsuitable for Hahnemülhe paper I use. This is a frameless mounting with a sleek, rich and wonderfully contemporary look. This method of mounting under acrylic glass produces striking images with razor sharp details and with great luminosity and depth of colour, it works particularly well with Adam’s extremely high resolution images. The print is affixed to a 3mm panel of aluminium dibond and then a panel of 2-6mm acrylic glass is bonded directly on top. This can then be affixed to the wall with an aluminium subframe on the back so that the image sits just flat and just a couple of centimetres off the wall when hung. 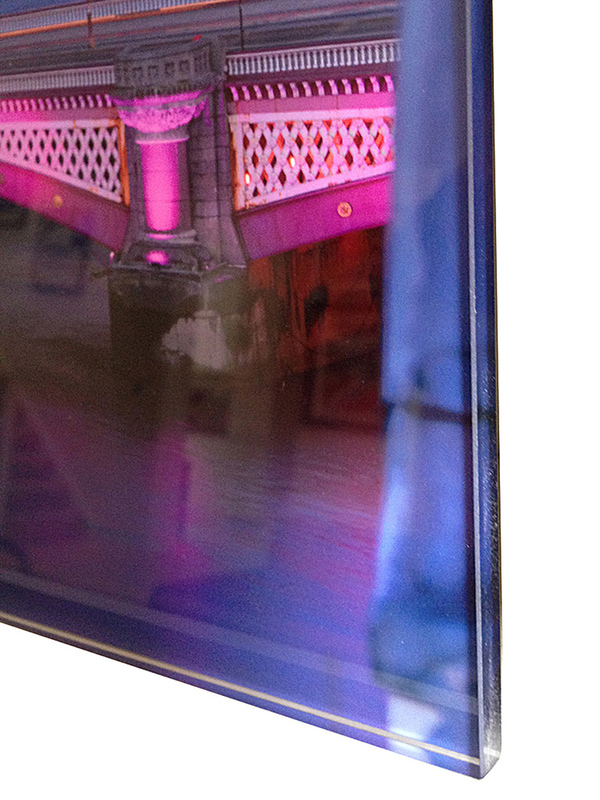 Mounting a print directly onto aluminium is also frameless and extremely light and modern in feel. 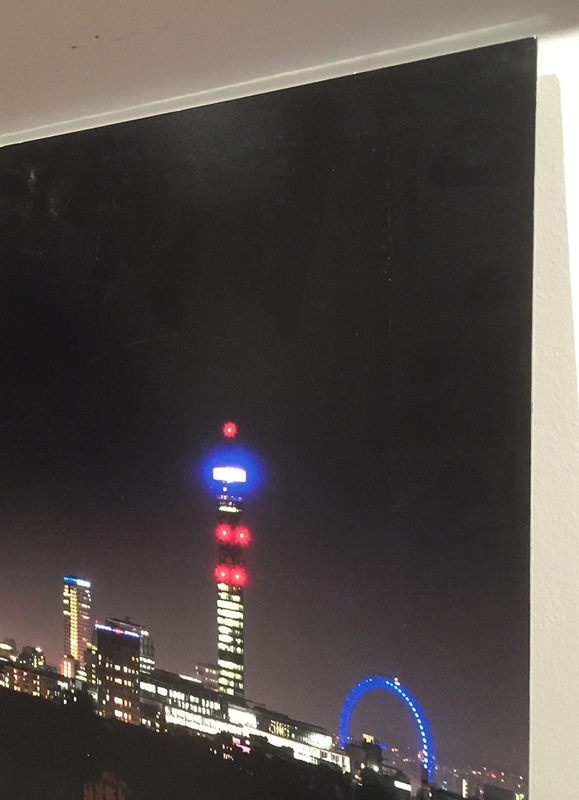 The print is affixed to a panel of aluminium with an invisible lamination on top to protect the surface of the print. This frameless mount is affixed to the wall with an aluminium subframe on the back so that the image sits just a couple of centimetres off the wall when hung. This method of mounting is superb with contemporary images and in modern interiors. This is an alternative to the aluminium mounting mentioned above, but rather than a print being mounted onto a panel, the image is instead printed directly onto aluminium, wood, perspex, glass, canvas, MDF, foamboard, etc. Printing onto aluminium gives a metallic finish to the lighter tones which can be very effective in certain circumstances. Adam can produce in his studio archival giclée pigment prints which can then be framed with a matting board or in a box frame. Printing and mounting with any other media means outsourcing to a specialist lab, therefore prices can only be given upon request and after checking with them. Of course, Adam inspects personally each print, wherever possible. Please feel free to email Adam with any queries or to ask for a quote.